10% OFF/- on all Jura Refurbished Espresso Machines. Now, get your favorite Jura Refurbished Machines at unbelievably exciting prices. Note that the offer only applied to the Jura Refurbished Machines and not on the acessories. The Offer Ends On 15/02/2019 at 11:59 PM or when the supplies last. Now, get your favorite WMF 1300 (03.1300.0504) for just $6500/- only. 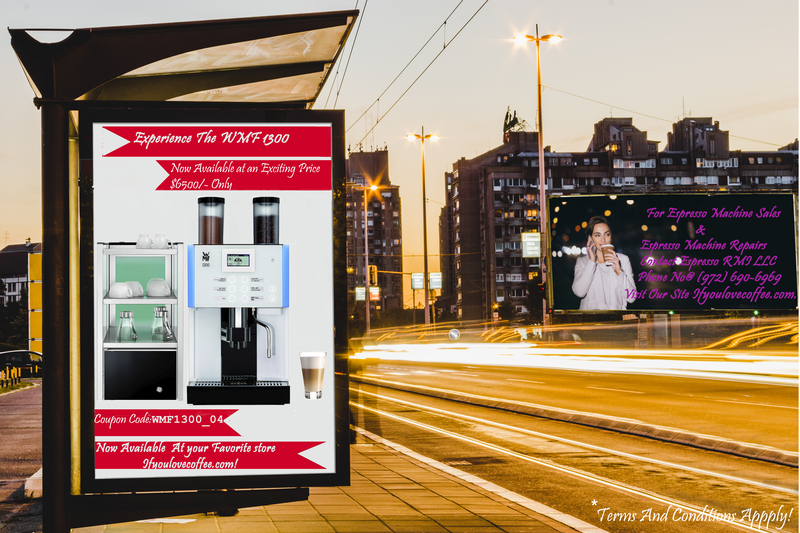 Use coupon code WMF1300_04 at checkout to claim discount.Note that the offer only applied to the espresso machine and not on the acessories. The Offer Ends On 02/09/2019 Coupon may be used once per transaction. Coupon is subject to one per customer. Coupons cannot be combined with other coupons. Get 15% off your Residential Machines during Black Friday from 11/23/2018 to 11/28/2018. Use coupon code Black_18T3 at checkout to claim discount. Coupon may be used once per transaction. Coupon is subject to one per customer. Coupons cannot be combined with other coupons. Get $100 off you next purchase of $1000 or more. Use coupon code 100_Off at checkout to claim discount. Coupon may be used once per transaction. Coupon is subject to one per customer. Coupons cannot be combined with other coupons. Get $500 on New Arrivals. Use coupon code 500_OFF at checkout to claim discount. Coupon may be used once per transaction. Coupon is subject to one per customer. Coupons cannot be combined with other coupons.